Ultrasonic welding is a method of bonding together two parts made of the same or chemically compatible materials using high frequency ultrasonic vibrations that create a solid state weld between them. The advantage of using this technique with plastics is that within seconds a high strength, gas and water tight bond is formed without screws, glue, threads, solder or any other type of bonding material. Parts that have been welded do not need to be left in a jig for curing, making them immediately useable in an automation line. The ultrasonic welding of plastics is an eco-friendly process that consumes very little energy while producing a cost effective, permanent, and clean weld. The process is used in the electrical, computer, automotive, aerospace, medical, and packaging industries, to name a few. 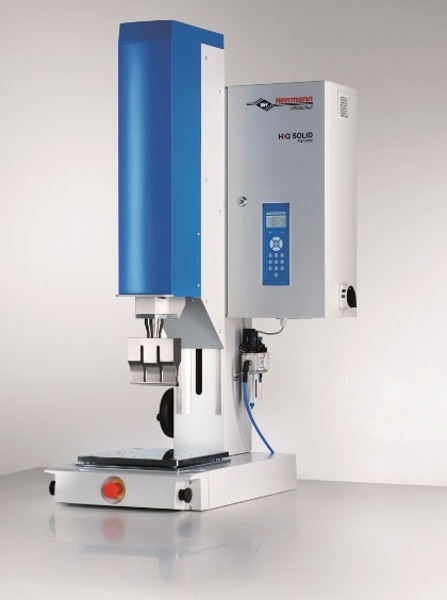 An ultrasonic welding machine is made up of a transducer assembly called the stack. This is made up of three components: a sonotrode, a booster and a weld horn. The sonotrode is the source of vibration. Inside it are piezoelectric ceramic disks sandwiched around metal plates that are clamped tightly to a titanium cylinder. High frequency electricity is then fed to it through a cable from the system power module. As this does not create enough vibration to get a melt temperature for most thermoplastic resins, a booster is used to amplify the input vibrations to the ratio required for the welding process. The weld horn transfers the energy in the vibrations to the thermoplastic work pieces. The weld horn is designed to match the contours of the specific work pieces. It attenuates the vibration to a specific value and applies the forces required to make the process work. This welding process depends on the plastics being used softening but not melting, thus it is best suited to thermoplastics and not thermoset polymers. Most thermoplastics have an amorphous structure with some degree of crystallinity, meaning there are some areas that have an ordered structure. Thermoplastics soften over a wide range of temperatures and have a glass transition temperature. Thermoset polymers are crystalline and have a distinct melting point. A crystalline polymer will stay solid until it reaches its melting point and then melt all at once. Amorphous thermoplastics also have a lower specific gravity, lower tensile strength and tensile modulus, higher ductility and impact strength and lower creep resistance compared to most crystalline polymers. For example, ABS, acrylic, polycarbonate and PVC are amorphous polymers with little or no crystalline structure. These plastics are well suited to ultrasonic welding. Ultrasonic welding of two parts made from the same plastic material will usually obtain the best result. However, in some cases two different thermoplastics can be welded using ultrasonics, for example when the materials are chemically compatible and have similar melting points. One of the best combinations of plastics for this kind of welding is ABS and acrylic. Polymers such as PE, PP, PE and PIA are crystalline and tend to absorb vibrations before the energy from the ultrasonic welder can pass through to the weld site. It is therefore difficult to join any of these using this kind of welding. One of the most commonly requested combinations is polyethylene and polypropylene, but these are both crystalline and not chemically compatible. Sonic welding is used to make butane lighters, toys, pipettes and intravenous catheters. The upper portions of athletic shoes are frequently made using ultrasonic welding rather than stitching or gluing. The manufacturing process for household appliances requires many plastic parts to be joined together. Examples of this process include the display screen on the front panel of a washing machine and the two halves of a pump wheel. In the automotive industry, there are hundreds of uses for sonic welding including welding together parts of tail lights, the instrument cluster, and bumpers. There have been reports that Apple is looking to use this technique to make their earbuds, having used the process successfully on some of their other products. 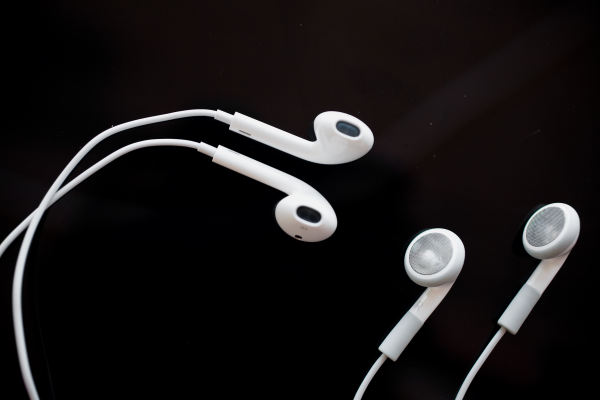 This will give the earbuds a more streamlined appearance. Looking for more ways to adhere different plastics? 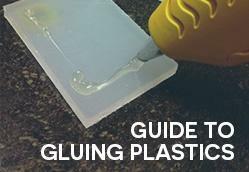 Check out our complimentary guide to gluing plastics! We don’t do ultrasonic assembly. I’d suggest contacting your material supplier for an answer – they should readily know.